This article is about the rocket fuel. For the protein, see RP1. For other uses, see RP 1. RP-1 is most commonly burned with LOX (liquid oxygen) as the oxidizer, though other oxidizers have also been used. RP-1 is a fuel in the first-stage boosters of the Soyuz-FG, Zenit, Delta I-III, Atlas, Falcon 9, Antares, and Tronador II rockets. It also powered the first stages of the Energia, Titan I, Saturn I and IB, and Saturn V. ISRO is also developing a RP-1 fueled engine for its future rockets. During and immediately after World War II, alcohols (primarily ethanol, occasionally methanol) were the most common fuels for large liquid-fueled rockets. Their high heat of vaporization kept regeneratively-cooled engines from melting, especially considering that alcohols would typically contain several percent water. However, it was recognized that hydrocarbon fuels would increase engine efficiency, due to a slightly higher density, the lack of an oxygen atom in the fuel molecule, and negligible water content. Whatever hydrocarbon was chosen, though, would have to replicate alcohol's coolant ability. Many early rockets burned kerosene, but as burn times, combustion efficiencies, and combustion-chamber pressures increased, engine masses decreased, which led to unmanageable engine temperatures. Raw kerosene used as coolant tends to dissociate and polymerize. Lightweight products in the form of gas bubbles cause cavitation, and heavy ones in the form of wax deposits block narrow cooling passages in the engine. The resulting coolant starvation raises temperatures further, and causes more polymerization which accelerates breakdown. The cycle rapidly escalates (i.e. thermal runaway) until an engine wall rupture or other mechanical failure occurs, and it persists even when the entire coolant flow consists of kerosene. In the mid-1950s rocket designers turned to the chemical engineers to formulate a heat-resistant hydrocarbon, with the result being RP-1. First, sulfur compounds were severely restricted. Small amounts of sulfur are naturally present in fossil fuels. It was known that sulfur and sulfur compounds attack metals at high temperatures. In addition, even small amounts of sulfur assist polymerization. Alkenes and aromatics were held to very low levels. These unsaturated hydrocarbons tend to polymerize not only at temperature, but during long periods of storage. At the time, it was thought that kerosene-fueled missiles might remain in storage for years awaiting activation. This function was later transferred to solid-fuel rockets, though the high-temperature benefits of saturated hydrocarbons remained. Because of the low alkenes and aromatics, RP-1 is less toxic than various jet and diesel fuels, and far less toxic than gasoline. The more desirable isomers were selected or synthesized. Linear alkanes were removed in favor of highly branched and cyclic molecules. This increased resistance to thermal breakdown, much as these isomer types improve octane rating in piston engines. Jet engines and heating and lighting applications, the prior users of kerosene, had been much less concerned with thermal breakdown and isomer contents. The most desirable isomers were polycyclics, loosely resembling ladderanes. In production, these grades were processed tightly to remove impurities and side fractions. Ashes were feared likely to block fuel lines and engine passages, as well as wear away valves and turbopump bearings lubricated by the fuel. Slightly too-heavy or too-light fractions affected lubrication abilities and were likely to separate during storage and under load. The remaining hydrocarbons are at or near C12 mass. Because of the lack of light hydrocarbons, RP-1 has a high flash point and is less of a fire hazard than gasoline/petrol or even some jet and diesel fuels. All told, the final product is more expensive than straight-run kerosene. On paper, any petroleum can produce some RP-1 with enough processing. In practice, the fuel is sourced from a small number of oil fields with high-quality base stock. This, coupled with small demand in a niche market compared to other petroleum users, drives the price. Military specifications of RP-1 are covered in MIL-R-25576, and the chemical and physical properties of RP-1 are described in NISTIR 6646. Soviet and Russian rocket-grade kerosenes are very similar to RP-1 and are designated T-1 and RG-1. Densities are higher, 0.82 to 0.85 g/ml, compared to RP-1 at 0.81 g/ml. For a short period, the Soviets achieved even higher densities by super-chilling the kerosene in a rocket’s fuel tanks, but this partially defeated the purpose of using kerosene over other super-chilled fuels. In the case of the Soyuz and other R7-based rockets, the temperature penalty was minor. Facilities were already in place to manage the vehicle's cryogenic liquid oxygen and liquid nitrogen, both of which are far colder than the kerosene temperature. The launcher's central kerosene tank is surrounded on four sides and the top by liquid-oxygen tanks; the liquid-nitrogen tank is nearby at the bottom. The kerosene tanks of the four boosters are relatively small and compact, and also between a liquid-oxygen and a liquid-nitrogen tank. Thus, once the kerosene was chilled initially, it could remain so for the brief time needed to finish launch preparations. The latest version of Falcon 9, Falcon 9 Full Thrust, also has the capability of sub-cooling the RP-1 fuel to −7 °C, giving a 2.5–4% density increase. Chemically, a hydrocarbon propellant is less efficient than hydrogen fuel because hydrogen releases more energy per unit mass during combustion, enabling a higher exhaust velocity. This is, in part, a result of the high mass of carbon atoms relative to hydrogen atoms. Hydrocarbon engines are also typically run fuel-rich, which produces some CO instead of CO2 as a consequence of incomplete combustion, although this is not unique to hydrocarbon engines, as hydrogen engines are also typically run fuel-rich for the best overall performance. Some Russian engines run their turbopump preburners oxygen-rich, but the main combustion chamber is still run fuel-rich. All told, kerosene engines generate a Isp in the range of 270 to 360 seconds, while hydrogen engines achieve 370 to 465 seconds. During engine shutdown, fuel flow goes to zero rapidly, while the engine is still quite hot. Residual and trapped fuel can polymerize or even carbonize at hot spots or in hot components. Even without hot spots, heavy fuels can create a petroleum residue, as can be seen in gasoline, diesel, or jet fuel tanks that have been in service for years. Rocket engines have cycle lifetimes measured in minutes or even seconds, preventing truly heavy deposits. However, rockets are much more sensitive to a deposit, as described above. Thus, kerosene systems generally entail more teardowns and overhauls, creating operations and labor expenses. This is a problem for expendable engines, as well as reusable ones, because engines must be ground-fired some number of times before launch. Even cold-flow tests, in which the propellants are not ignited, can leave residues. On the upside, below a chamber pressure of about 1000 psi (6.9 MPa), kerosene can produce sooty deposits on the inside of the nozzle and chamber liner. This acts as a significant insulation layer and can reduce the heat flow into the wall by roughly a factor of two. Most modern hydrocarbon engines, however, run above this pressure, therefore this is not a significant effect for most engines. Recent heavy-hydrocarbon engines have modified components and new operating cycles, in attempts to better manage leftover fuel, achieve a more-gradual cooldown, or both. This still leaves the problem of non-dissociated petroleum residue. Other new engines have tried to bypass the problem entirely, by switching to light hydrocarbons such as methane or propane gas. Both are volatiles, so engine residues simply evaporate. If necessary, solvents or other purgatives can be run through the engine to finish dispersion. The short-chain carbon backbone of propane (a C3 molecule) is very difficult to break; methane, with a single carbon atom (C1), is technically not a chain at all. The breakdown products of both molecules are also gases, with fewer problems due to phase separation, and much less likelihood of polymerization and deposition. However, methane (and to a lesser extent propane) reintroduces handling inconveniences that prompted kerosenes in the first place. The low vapor pressure of kerosenes gives safety for ground crews. However, in flight the kerosene tank needs a separate pressurization system to replace fuel volume as it drains. Generally, this is a separate tank of liquid or high-pressure inert gas, such as nitrogen or helium. This creates extra cost and weight. 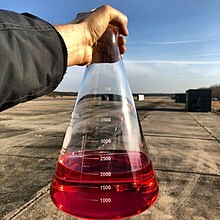 Cryogenic or volatile propellants generally do not need a separate pressurant; instead, some propellant is expanded (often with engine heat) into low-density gas and routed back to its tank. A few highly volatile propellant designs do not even need the gas loop; some of the liquid automatically vaporizes to fill its own container. Some rockets use gas from a gas generator to pressurize the fuel tank; usually, this is exhaust from a turbopump. Although this saves the weight of a separate gas system, the loop now has to handle a hot, reactive gas instead of a cool, inert one. Regardless of chemical constraints, RP-1 has supply constraints, due to the very small size of the launch-vehicle industry versus other consumers of petroleum. While the material price of such a highly refined hydrocarbon is still less than many other rocket propellants, the number of RP-1 suppliers is limited. A few engines[specify] have attempted to use more standard, wide-distribution petroleum products such as jet fuel or even diesel. By using alternate or supplemental engine cooling methods, some can tolerate the non-optimal formulations. Any hydrocarbon-based fuel when burned produces more air pollution than hydrogen. Hydrocarbon combustion produces carbon dioxide (CO2), toxic carbon monoxide (CO), hydrocarbon (HC) emissions, and oxides of nitrogen (NOx), while hydrogen (H2) reacts with oxygen (O2) to produce only water (H2O), with some unreacted H2 also released. Robert H. Goddard's initial rockets used gasoline. John Drury Clark mentions in Ignition! that while the RP-1 specification was being developed, Rocketdyne was experimenting with diethyl cyclohexane. However, it offered few advantages over RP-1, and was dropped. In addition, the military (NASA did not yet exist) preferred RP-1 because it was processed alongside jet fuels in the same refineries. 16). Russia has also announced plans[when?] to switch the Soyuz-2 from RG-1 to "naftil" or "naphthyl". After the RP-1 standard, RP-2 was developed. The primary difference is an even lower sulfur content. However, as most users accept RP-1, there was little incentive to produce and stock a second, even rarer and more expensive formulation. The OTRAG group launched[when?] test vehicles using more common blends. In at least one instance, a rocket was propelled by diesel fuel. However, no OTRAG rocket came even close to orbit. ^ "Basics of Space Flight: Rocket Propellants". Braeunig.us. Retrieved 2012-12-11. ^ "Thermophysical Properties Measurements and Models for Rocket Propellant RP-1: Phase I (NISTIR 6646)" (PDF). ^ "Vostochny launches on schedule for 2017". Russian Space Web. Retrieved February 5, 2018. ^ "When will Russia's 1st carrier rocket firing naphthyl blast off?". Russia Now. 2016-10-11. Retrieved 2018-01-29.